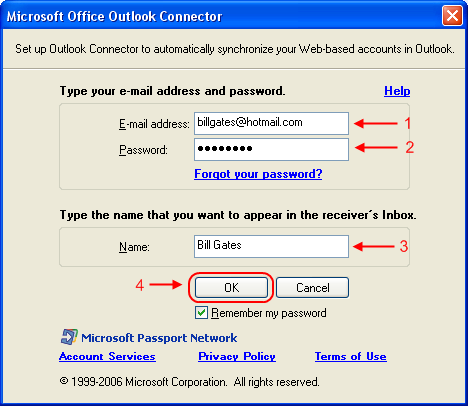 There are two methods that you can use to setup your Hotmail account in Outlook 2007. The method that I’m showing in this post is by using the Outlook Connector. The Outlook Connector is a plugin for Outlook 2003 and 2007. The plugin will enable you to retrieve your mail from your Hotmail account using Outlook. Please note that this method will only work with Microsoft Office Outlook, and not Outlook Express! Step 2: After you downloaded the installer, run it and follow the steps in the wizard. It should be pretty straight forward. Step 3: Once the installation is complete, open your Outlook. You should be able to see the “Outlook Connector” in your menu bar. Step 5: You should be seeing the window in the screen shot above. Fill in your Hotmail/Windows Live email address and the password in the field provided. The name field is for you to specify the name you want to be displayed when you send an email. After you completed all the fields, click OK. Step 6: After adding the email account, you need to restart Outlook. Once you restarted your Outlook, you can start using your Hotmail account using Outlook! It will take some time for Outlook to download all your emails to your PC, so please be patience. 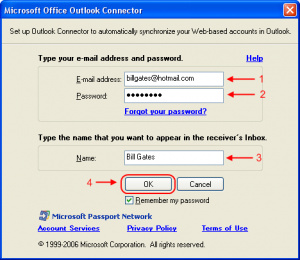 The other method that you can use to download your mail to Outlook is by using POP3. I will post another guide for that. 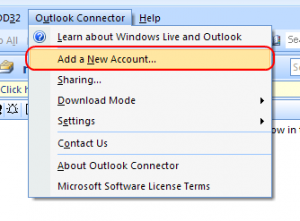 But, there are some other features that you can use if you use the Outlook Connector. These features are managing your contacts and calendar using Outlook! You can’t do that if you are using POP3. The disadvantage of using the Connector plugin is that it only works with Outlook and not other email client. And it is only compatible with Outlook 2003 and above. In my opinion, if you have Outlook installed, go ahead and use the connector. If not, you can still use the POP3 method. This entry was posted in Guide, Software and tagged configure, email client, hotmail, microsoft, outlook, webmail. Bookmark the permalink. I installed the connector, but I don’t see ‘Outlook Connector” when opening Outlook (2007). What should I do? naturally like your web-site however you need to check the spelling on quite a few of your posts. A number of them are rife with spelling issues and I find it very troublesome to tell the truth on the other hand I will definitely come again again. Thanks , this post helped ! The method was great and its working all fine. Thanks for the tip. I am struggling to sync my hotmail contacts with Outlook 2007. For some weird reason the contacts and calendar are not getting synced. Thanks for sharing such a wonderful knowledge. It really helps me a lot. In my outlook daily received all mail so any suggestion so kindly re-play me. of your blog and keep checking for new information about once per week.